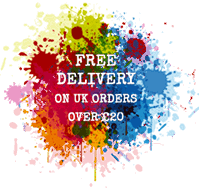 Established in 2005, we are a small family run, online craft business based in Essex in the UK. We sell a wide range of mixed media and papercraft supplies. We also hold workshops in our onsite art room. In July 2015 we launched our Dinky stencils and we now have our own range of That's Crafty! Surfaces, That's Crafty! Stamps and That's Crafty! paints and mediums. We don't produce a paper catalogue, as we are continually adding new products to our range and we aren't able to keep a paper catalogue up to date. We ship worldwide, please see our info here on how to place on overseas order. Please note we are an online shop only.